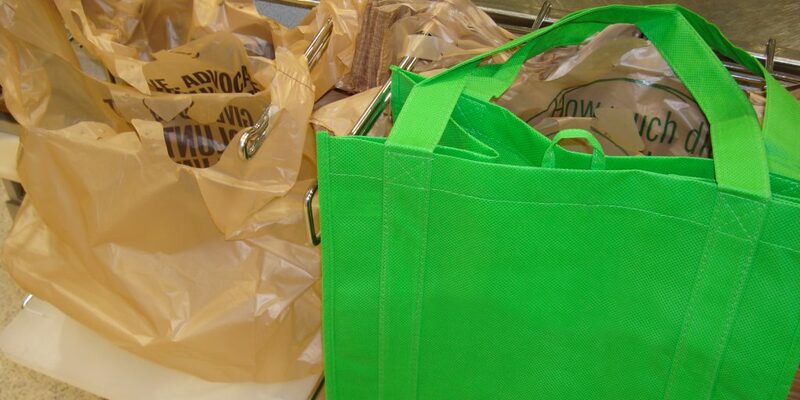 Oklahoma House legislators will soon decide on a bill that would prohibit municipalities from applying a fee or ban on single-use plastic and paper bags. Oklahoma Senate Bill 1001 prohibits cities and towns from levying a fee or banning “auxiliary containers” made of glass, aluminum, cardboard, plastic, cloth and paper, Oklahoma TV station KFOR reports. The bill passed the state senate in a 35-9 vote on March 6. Currently, 11 states have such laws in place, the Associated Press reports. The bill makes Oklahoma among five states in which officials are considering disallowing local governments from banning or taxing plastic bags. The measure was proposed as Norman, Okla., officials are considering a 5-cent fee on single-use paper and plastic bags in an attempt to limit pollution and littering, the AP reports. Norman Mayor-Elect Breea Clark said that the city is a leader in curbside recycling, but because Oklahoma recyclers are not accepting single-use plastic bags, people are having to throw the bags away, KFOR reports. Imposing such a fee could change consumer habits, Clark says. Oklahoma Sen. Mary Boren, D-Norman, voted against the pre-emption bill and claims that the move would “chill that innovative spirit that we have,” the AP reports. “We have a reputation of being very progressive on environmental policies and this bill, we feel, is targeting that initiative and trying to throw cold water on our local value system that we have taking care of the environment,” Boren told KFOR. Proponents of the bill claim that larger cities imposing such a ban could affect the state economy. “[If] just one of those cities was to ban, let’s say, cardboard… you have a distributor, a food that ships their product in cardboard… [that] has to change for the larger port of the population. You can imagine, for the rest of the state, prices would either go up, or they wouldn’t distribute that product anymore,” Leewright told KFOR. If the Oklahoma House passes the bill and it is signed into law, it would go into effect on July 1, KFOR reports. A House Business and Commerce Committee hearing is scheduled for March 27.